Google Apps users generate a lot of content at work—project plans, design documents, client presentations, and more. Many of these files are still relevant to an employee’s company or team even after he or she has left or transferred internally. The new Data Transfer API will make it easier for developers to build tools that will allow admins to better manage their end-user data, specifically apps that can transfer ownership of Google Docs, Sheets, and Slides, and all the other Google Drive files as well as Google+ pages in your Google for Work account—in bulk—from one employee/end-user to another using the API. In July, we introduced the Data Transfer privilege, which makes it easier for admins to transfer data ownership. That same privilege is leveraged by the Data Transfer API. When enabled, it allows admins to programmatically migrate file ownership anytime they want using the API—provided they’ve enabled API access. 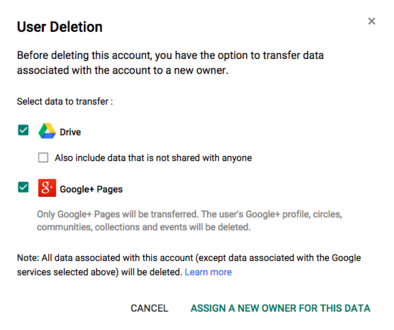 In order to transfer ownership of Google Drive content as well as Google+ pages, super admins will need to grant/delegate the Data Transfer privilege to admins before end-user content can be migrated programmatically (via API or 3rd-party tools) or from the admin console. but now you can also do this programmatically with the API. To get started with the Data Transfer API, take a look at the developer documentation. Keep in mind that while this programmatic feature is new, admins can still transfer user data manually from the admin console. For more general information, see the Help Center pages on transferring file ownership on Google Drive and how to delete a user.